Before starting the activities, be sure to go over the directions with your child. 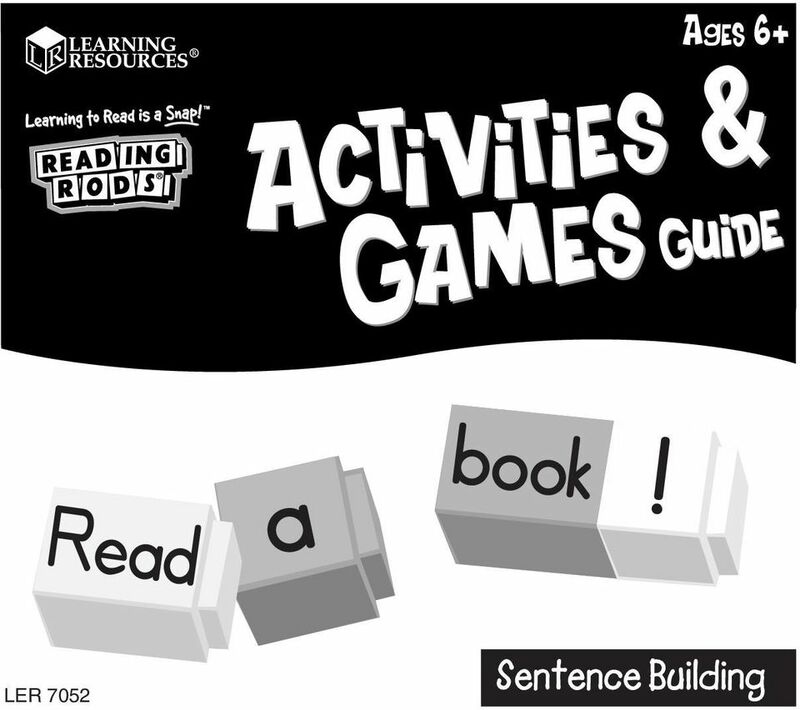 Download "Before starting the activities, be sure to go over the directions with your child." 1 Note to Parents The activities and games in this book have been designed to give your child a challenging and fun way to learn the parts of speech and simple sentence-building skills. Encourage your child to apply these skills to stories and daily reading and writing by identifying parts of speech, recognizing synonyms and antonyms, and building complete simple sentences with correct punctuation. Before starting the activities, be sure to go over the directions with your child. 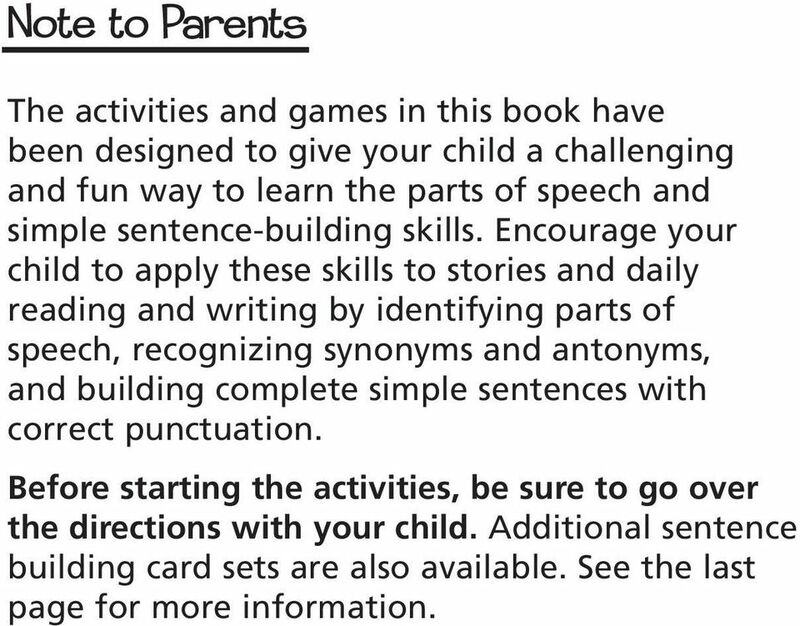 Additional sentence building card sets are also available. See the last page for more information. 4 For a challenge, go through the alphabet and think of a noun that starts with each letter! 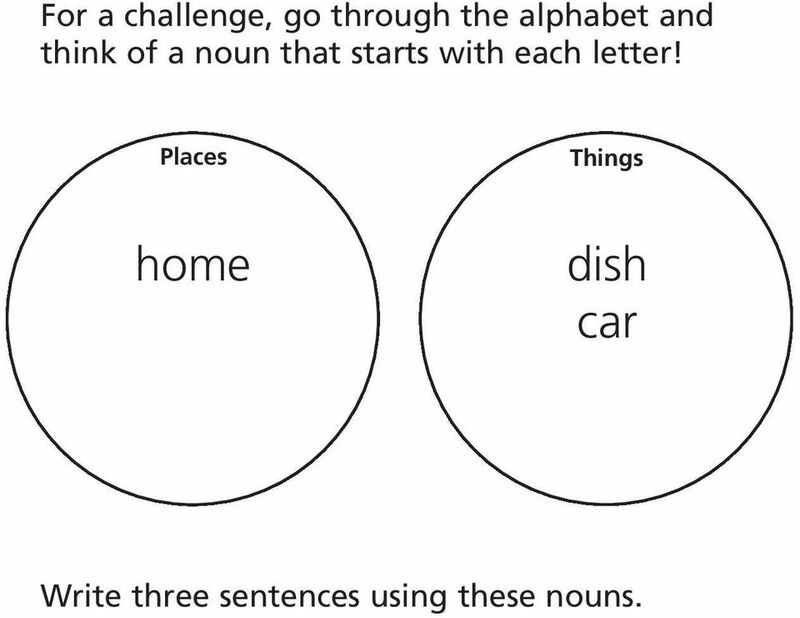 Places Things home dish car Write three sentences using these nouns. 6 in a sentence. Write the matches you built in the body of the hound dog. 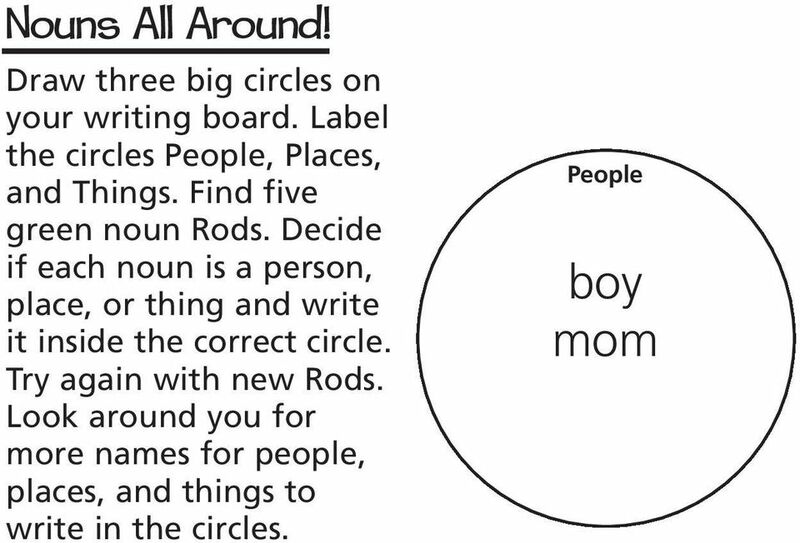 Next, find the green "s" and "es" Rods, and use them to make the nouns plural (more than one person, place, or thing). 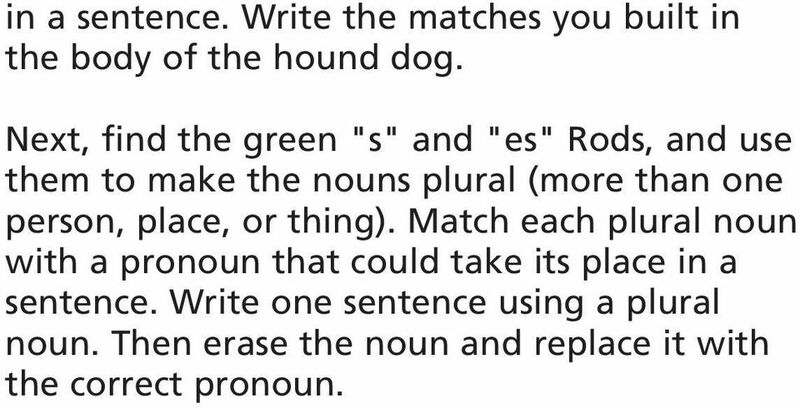 Match each plural noun with a pronoun that could take its place in a sentence. Write one sentence using a plural noun. Then erase the noun and replace it with the correct pronoun. 7 Ready, Set, Action! Play this game with a friend. Choose a yellow verb Rod without letting your friend see it. If you draw an action verb, act it out and have your friend try to guess the word. Give hints to help. 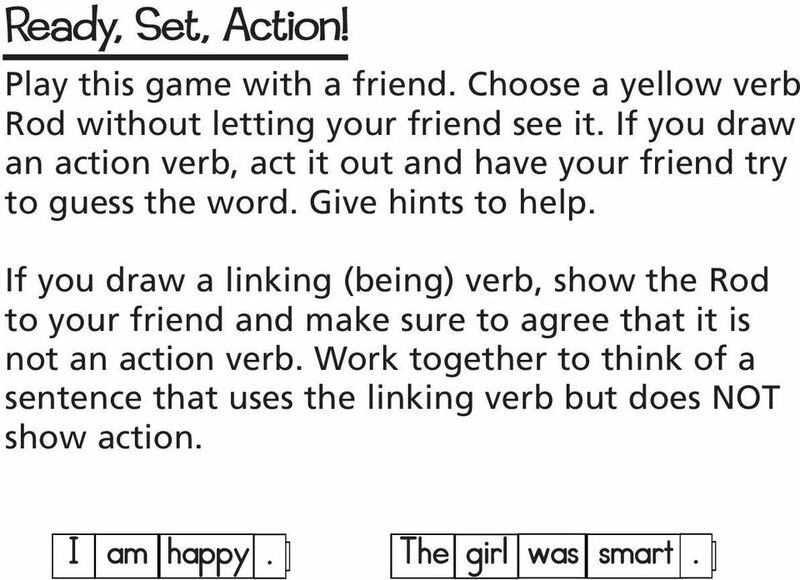 If you draw a linking (being) verb, show the Rod to your friend and make sure to agree that it is not an action verb. Work together to think of a sentence that uses the linking verb but does NOT show action. I am happy. The girl was smart. 8 A Helping Hand Trace the outline of your hand on your writing board. 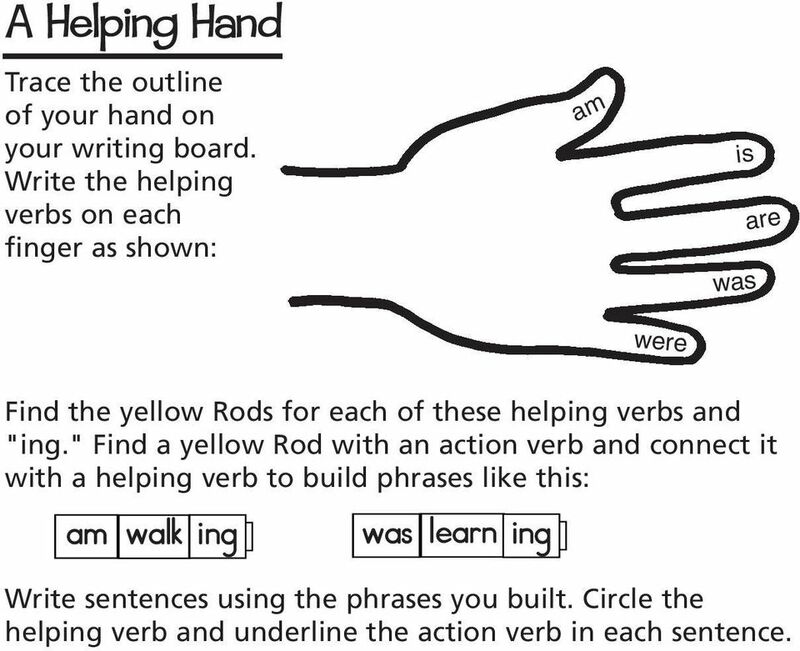 Write the helping verbs on each finger as shown: am is was are were Find the yellow Rods for each of these helping verbs and "ing." Find a yellow Rod with an action verb and connect it with a helping verb to build phrases like this: am walk ing was learn ing Write sentences using the phrases you built. Circle the helping verb and underline the action verb in each sentence. 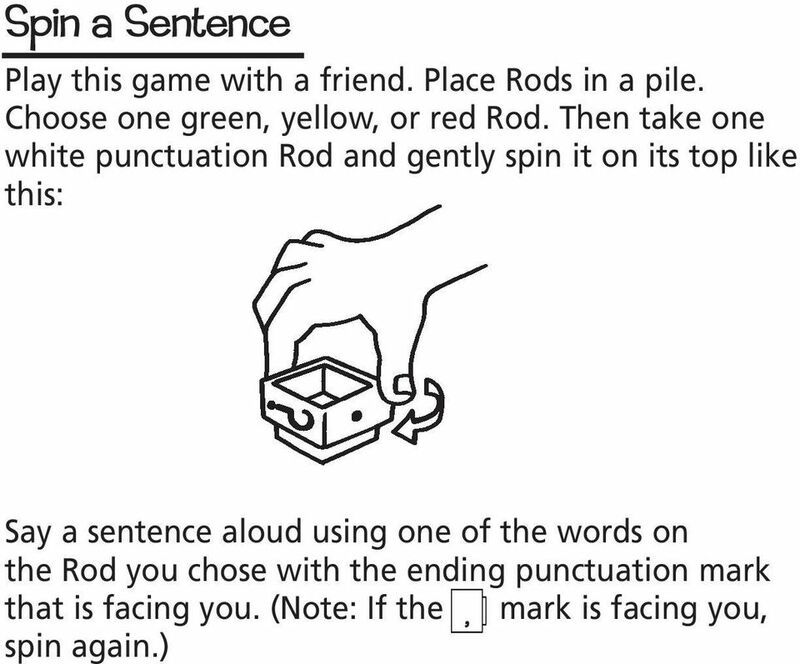 9 Silly Sentences Pick five red adjective Rods, five green noun Rods, and find the green s and es Rods. Match adjective and noun Rods to make word phrases. Add "s" or "es" if you need to make a noun plural. 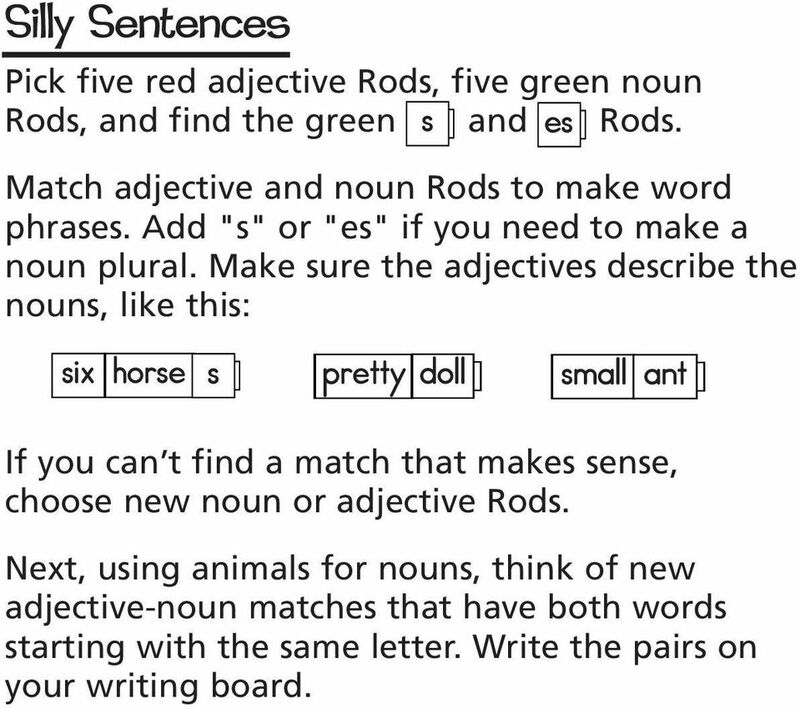 Make sure the adjectives describe the nouns, like this: six horse s pretty doll small ant If you can t find a match that makes sense, choose new noun or adjective Rods. Next, using animals for nouns, think of new adjective-noun matches that have both words starting with the same letter. Write the pairs on your writing board. 10 Examples: What kind? brown bear Which one? fuzzy fox How many? 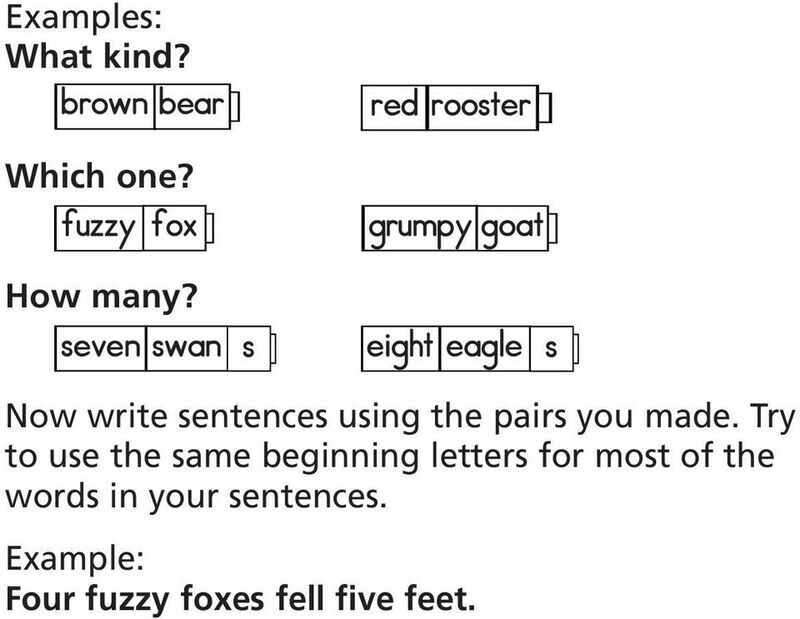 seven swan s red rooster grumpy goat eight eagle s Now write sentences using the pairs you made. Try to use the same beginning letters for most of the words in your sentences. Example: Four fuzzy foxes fell five feet. 12 Challenge! Play this game with a friend. 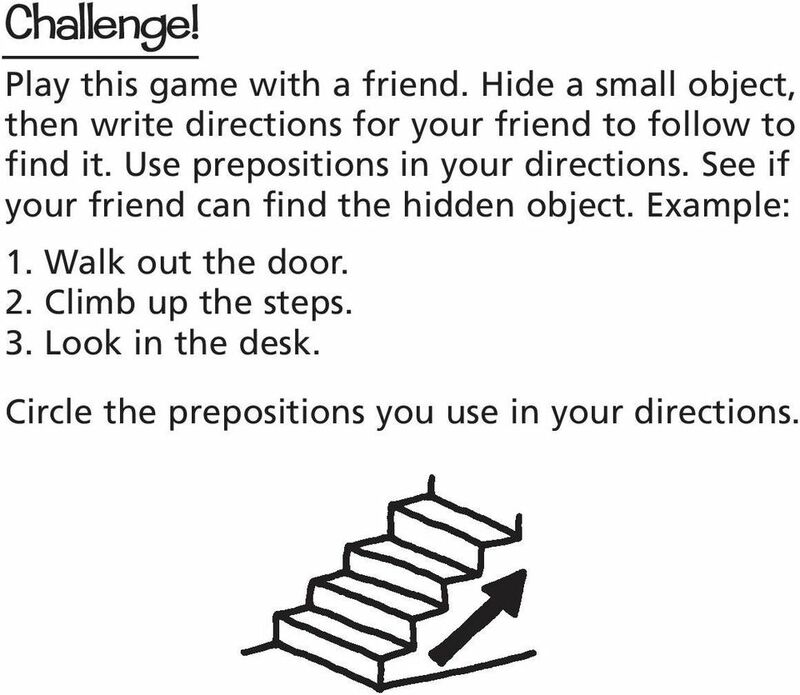 Hide a small object, then write directions for your friend to follow to find it. Use prepositions in your directions. See if your friend can find the hidden object. Example: 1. Walk out the door. 2. Climb up the steps. 3. Look in the desk. 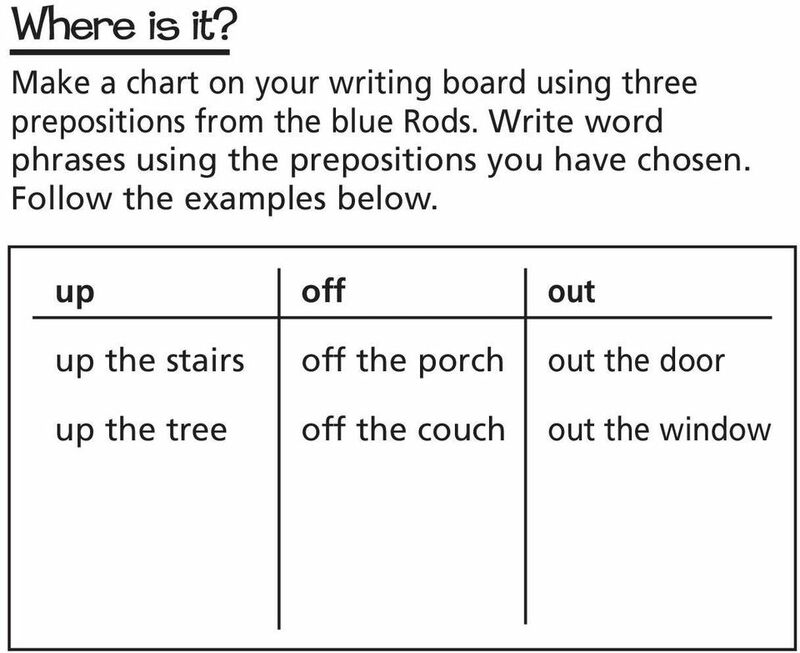 Circle the prepositions you use in your directions. 16 Tell what type of sentence you just made. Sentences ending in. are declarative and must tell information or make a statement. Example: She likes apples. Sentences ending in? are interrogatory and must ask a question. Example: Do you like apples? Sentences using! are exclamatory and must show strong emotion. Example: I love apples! 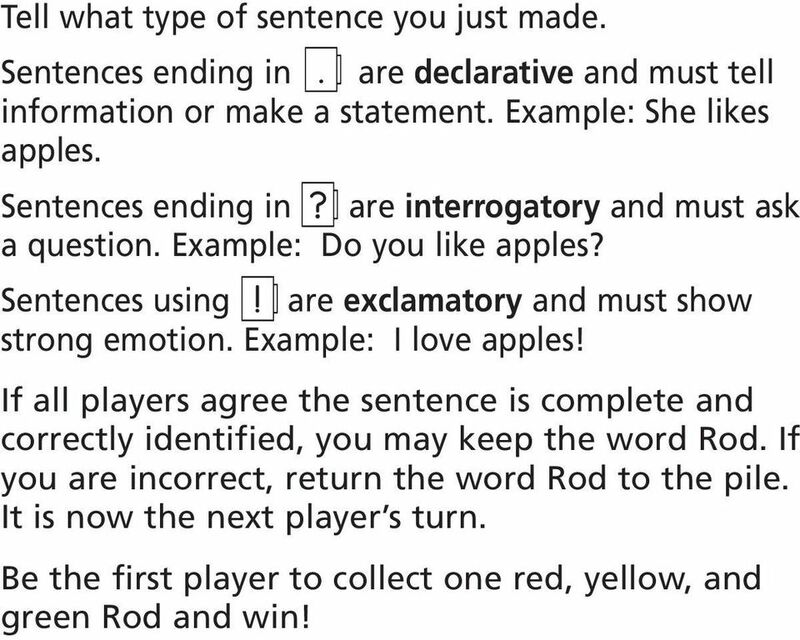 If all players agree the sentence is complete and correctly identified, you may keep the word Rod. If you are incorrect, return the word Rod to the pile. It is now the next player s turn. Be the first player to collect one red, yellow, and green Rod and win! 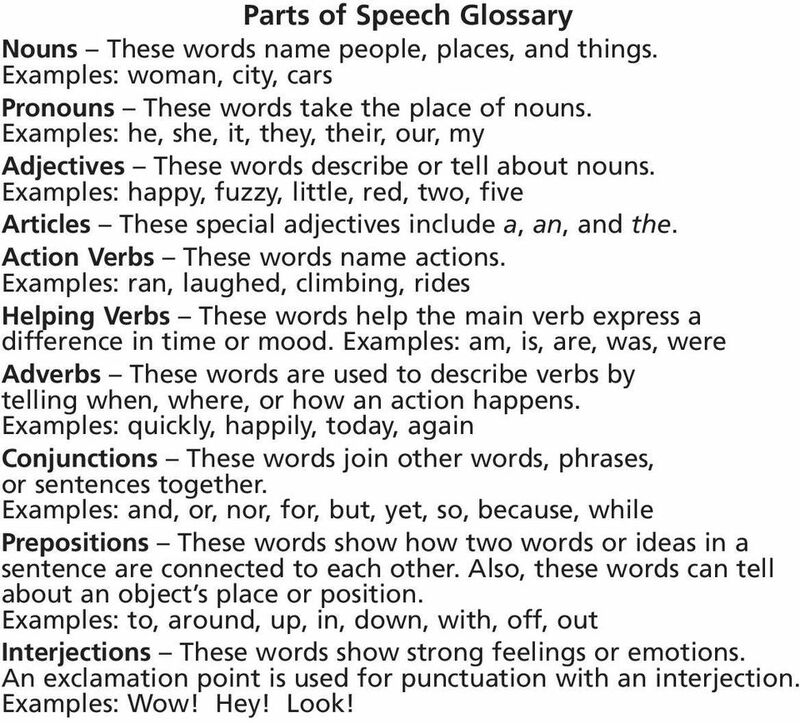 17 Parts of Speech Glossary Nouns These words name people, places, and things. 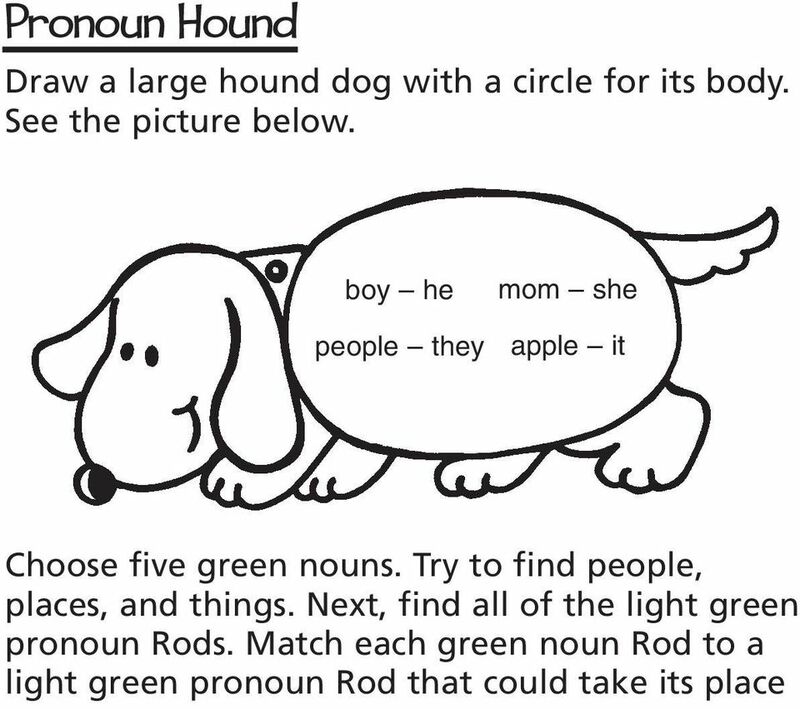 Examples: woman, city, cars Pronouns These words take the place of nouns. Examples: he, she, it, they, their, our, my Adjectives These words describe or tell about nouns. Examples: happy, fuzzy, little, red, two, five Articles These special adjectives include a, an, and the. Action Verbs These words name actions. Examples: ran, laughed, climbing, rides Helping Verbs These words help the main verb express a difference in time or mood. Examples: am, is, are, was, were Adverbs These words are used to describe verbs by telling when, where, or how an action happens. Examples: quickly, happily, today, again Conjunctions These words join other words, phrases, or sentences together. Examples: and, or, nor, for, but, yet, so, because, while Prepositions These words show how two words or ideas in a sentence are connected to each other. Also, these words can tell about an object s place or position. Examples: to, around, up, in, down, with, off, out Interjections These words show strong feelings or emotions. An exclamation point is used for punctuation with an interjection. Examples: Wow! Hey! Look! 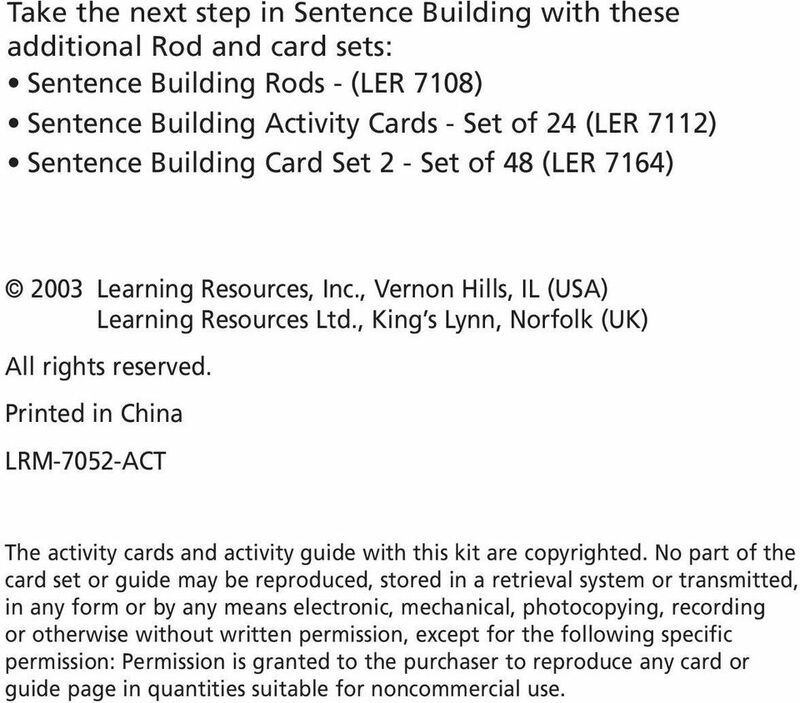 18 Take the next step in Sentence Building with these additional Rod and card sets: Sentence Building Rods - (LER 7108) Sentence Building Activity Cards - Set of 24 (LER 7112) Sentence Building Card Set 2 - Set of 48 (LER 7164) 2003 Learning Resources, Inc., Vernon Hills, IL (USA) Learning Resources Ltd., King s Lynn, Norfolk (UK) All rights reserved. Printed in China LRM-7052-ACT The activity cards and activity guide with this kit are copyrighted. No part of the card set or guide may be reproduced, stored in a retrieval system or transmitted, in any form or by any means electronic, mechanical, photocopying, recording or otherwise without written permission, except for the following specific permission: Permission is granted to the purchaser to reproduce any card or guide page in quantities suitable for noncommercial use. Abbreviation: A shortened form of a word. Abbreviations begin with a capital letter and end with a period. Example: Dr. is an abbreviation for Doctor. a. Jack works during the night. b. The red roses bloom in June. KS2 Grammar, Punctuation & Spelling 10-4-10 10 minutes a day for ten days Glossary for Parents Easter Revision 1 of 9 Grammar Term Function Examples Active voice Where the subject performs the action. Is The Tan Book Right For My Student? Nouns are naming words - they are used to name a person, place or thing. My first job. She is an adult a child. My Game. Or I say, I m in the window. Or else, I m out the door. I m on top of the table, Or I m under the floor. 1 Let's Write More Sentences! Lesson 1 Here is what we will learn in this lesson: What are compound subjects and verbs? What is a direct object? How do I use the dictionary? 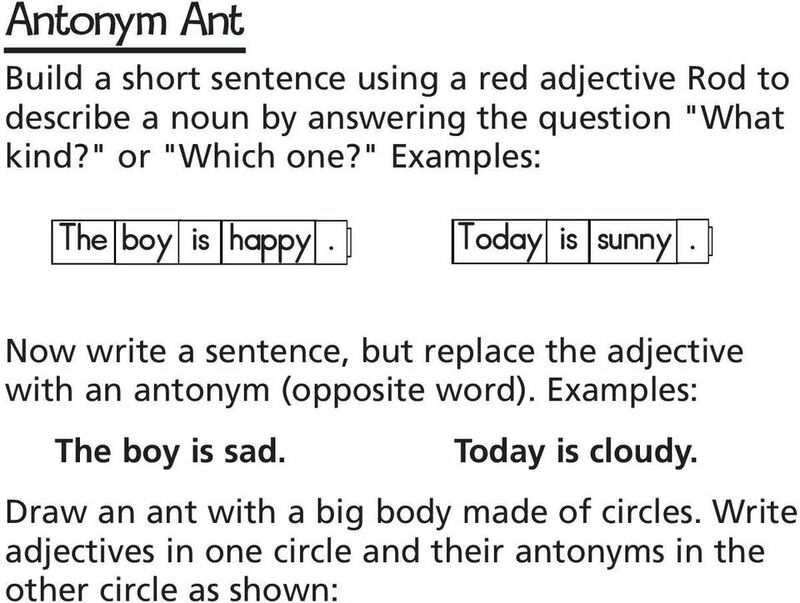 What are synonyms and antonyms? Sentence Parts. The cat jumped from the porch. James is a great piano player. Chapter 0 Student Objectives Lesson Practice Jingles 0. Identify Mixed Patterns. Classify Introductory Sentences. Review Patterns. Identify and write pattern numbers only for Patterns. Do Worksheet 5. 1. Choose the correct end punctuation for the sentence. 2. Choose the correct end punctuation for the sentence. Activity Underline the preposition in each sentence. Tell if it describes time, location, direction, or detail. Simile Poem A simile compares two things. For example: The kitten s fur is as soft a baby. The kitten s fur is being compared to a baby s skin. The writer uses the word as to help compare the two things. Antonyms around the Room 1. Two students stand next to each other. 2. The teacher calls out a word. 3. The first student to say the antonym for the word gets to move to the next person and try again. 4. Welcome to Spelling, Grammar and Punctuation Tuesday 2 nd February 2016 Aims of the session: ospag national expectations. ohow we are teaching grammar. ohow we are teaching spelling. ohow to help at home. LESSON 29 TEACHER S GUIDE by Lucy Fukushima Fountas-Pinnell Level A Informational Text Selection Summary Children show their favorite transportation toys: a truck, car, plane, train, and rocket that zooms!